To copy a survey, first click on the headline “Create a survey” on the start page of your Netigate account. You will get a selection where you can choose “Copy a survey” to create a new copy of the existing survey. This new copy can include all existing questions, settings, logic and E-mail/SMS texts etc. This function will create a completely separate version of the survey, it will not merge with an existing one. From this page you will access all surveys available for your account. The Netigate question library can also be accessed from this page. This library was created by Netigate specifically for your use. You can copy questions or get inspiration for new questions or surveys. In the library you will find different surveys within a number of fields and it is possible to copy all of them to your Netigate account. In this menu there is general information about the survey with survey name, start- and end date and in what language the survey was originally created. You may also click in order to get a preview of the specific survey. Click the option “Add this survey” to select which survey you wish to copy. You will get a new selection where you will need to enter the surveys name, category and start/end date of the survey. The survey start date will be automatically set to todays date and the end date is set to two weeks later, but you can of course adjust these dates to match your project. In addition you will select whether you wish to include advanced logic (the possibility to copy existing skip, and hide-logic etc) and if you wish to copy an existing sendout you can assign that by marking the checkbox “Select” next to the sendout that you wish to include. When you have filled out all the information, press “Create” to create the new copy of the survey or “Cancel” to dismiss the copy without creating anything. 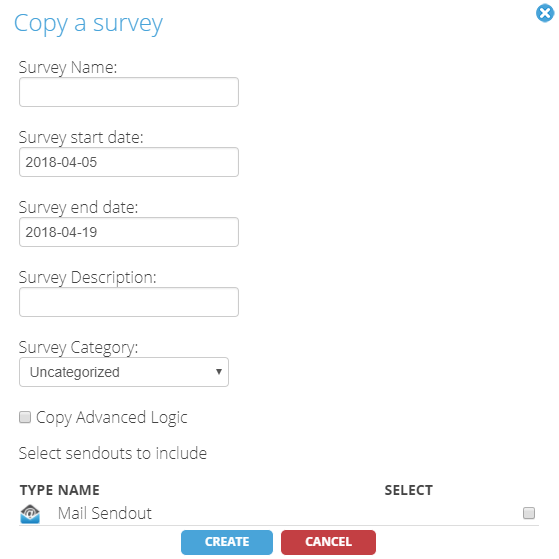 After the new copy is created you will automatically be forwarded to the new copy of the survey and you can start to work with it, in case you need to make changes or updates to it. Can you please provide more feedback so we can make this article better? Thank you for helping us improve this article! We offer support in German, English, and Swedish. Do you have a question and prefer to write? Send us a request - we will get back to you as soon as we can (within office hours).